The Seventh Curse: Indiana Jones….on Acid! I finally checked out a movie I’d been wanting to see now for the longest time-The Seventh Curse from 1986! This is surely one of the coolest movies that you’ve never seen! This Chinese action/ adventure/ horror movie has got it all and I’d really expect no less from a flick by Ngai Kai Lam. If you aren’t familiar with Lam you’ve missed out big time for a long time. Most famous for “Riki-Oh:The Story of Ricky” from 1991, which is seriously one of the coolest movies ever made, The Seventh Curse is equally as good in different yet similar ways. I guess I’d best have to describe The Seventh Curse as Hong Kong’s fucked up version of Indiana Jones, and I mean that in the best way possible. This one has it all really, a young adventuresome cop deep in the jungles of Thailand tries to rescue a beautiful girl from being sacrificed by the evil “Worm Tribe”. In doing so he’s captured by an evil witch Doctor who casts seven “Blood Curses” on him, which burst through his legs periodically. When the seventh bursts, it will affect his heart killing him swiftly. Betsy (a strange mane for a member of The Worm Tribe), the hot jungle vixen he saved, stops the curse with an antidote, that she draws from the most peculiar place(trust me). This however will only protect him for one year, so on the advice of his friend Wisely (Chow Yun-fat) he heads back to Thailand to find a permanent cure. Serious adventure ensues as the cop and his mercenaries battle the evil sorcerer of the Worm Tribe, a ridiculously hideous blood hungry baby-like creature, and finally “Old Ancestor,” a skeleton with glowing blue eyes that’s got some impressive kung fu chops himself and can transforms into something far more sinister! Sound like fun? You bet it is! Throw in some great 80’s style monster effects, some great sets, jungle adventure sequences, top notch kung fu, some nice gore and a bunch of really bizarro plot twists and you’ve got a true genre classic that is not to be missed by any fan of awesome odd ball cinema. 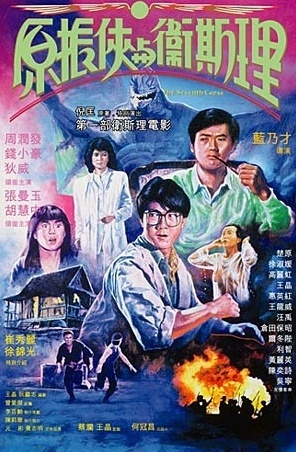 The Seventh Curse is just as cool in my opinion as Riki-Oh and it really makes me want to hunt down down more of Lam’s movies. This one pretty hard to find on dvd, but I’m sure it could be downloaded somewhere on line, or you could buy it on Amazon.com. If you’re craving some wild offbeat 80’s adventure then this one movie NOT to be missed!! !